“People grow plants for aesthetic reasons, to have prettier surroundings. But the state of the environment is critical and crying out for help,” Ribalta, the coordinator of Ando Reforestando, a community reforestation project, told IPS. This self-managed initiative also seeks to complement, in urban areas, the national reforestation plans. Nearly three years ago, Ribalta began to scatter seeds along the sidewalk in the next block over. “Some neighbours asked me if I had moved to the next block, others asked if I was crazy,” she said. But today she has a plan to fulfil as part of her contract with the Unidad Provincial de Áreas Verdes, or Provincial Greenbelt Unit. This state agency supports Ando Reforestando with seedlings and tools, along with the State Working Group for Sanitation, Conservation and Development of Havana Bay, the Cuban Association of Agricultural and Forestry Technicians, and the Workshop for the Comprehensive Transformation of the El Canal neighbourhood. Ribalta’s rooftop is a nursery for scarlet cordia, cherry, orange and moringa trees and amaranth plants, among others, which are good for shade and for purifying the city air without the risk of the roots lifting up the pavement. “Many people worry about this, which prevents them from planting a tree in their yards or along the sidewalks in front of their homes,” she said. “That’s why it’s important to raise awareness and make information available about alternatives for greening the city,” the activist said. She encourages the use of small trees, like fruit trees, and ornamental and medicinal plants, and only selects varieties of this kind from the Greenbelt nursery for her work. The Greenbelt Unit focuses on the care and plant repopulation of large areas like avenues and parks. By late 2011, 27 percent of Cuban territory was covered with trees, after steady growth of the country’s green areas since 1999, according to the National Office of Statistics and Information. Of the 72,800 hectares covered by greater Havana, 11.5 percent is forested. “Community needs in this area must be met by people themselves. Citizens must be mobilised,” said Ribalta, whose work has led to the planting of nearly one hundred trees. According to international studies, a key action for mitigating the effects of global warming is to increase forest cover in each country. The Cuban government’s National Forestry Programme has set a target of increasing forest cover to over 29 percent by 2015. In Ribalta’s view, there is still unexploited potential for greening the city. “We see planting strips along sidewalks that have been cemented over, and others that are bare ground. We also see large patios and yards without plants. The core group of Ando Reforestando, made up of 12 people, is currently searching for a place where they can hold workshops and lectures on subjects like permaculture, a method for creating sustainable environments. Ribalta believes that quality of life is improved when rooftops, balconies and terraces are decorated with plants and flowerpots. Although he can’t say why, José Luis Fraga knows he needs “a lot of greenery” around him. 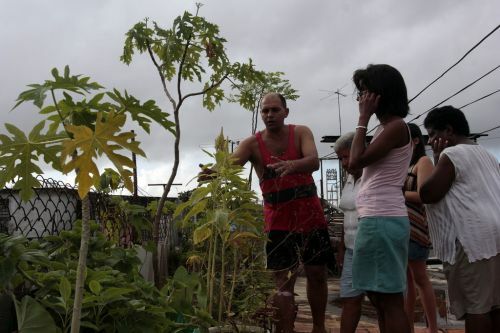 “Here I can breathe better now, and the air is fresher and cooler than in the street,” Fraga, a member of Ando Reforestando, told IPS as he showed off the ornamental plants lining the passageway to the entrance of his house. Alcibíades Pupo, who lives in Fraga’s neighbourhood, looks after the community gardens on a voluntary basis. “Plants and trees give us life and cool things down. They are necessary in this tropical climate, which has lately become hotter and more complicated,” the 68-year-old labourer said. Pupo’s perceptions are borne out by national studies. According to Cuba’s report to the United Nations Conference on Sustainable Development (Rio + 20), the island’s average annual temperature has increased by close to 0.9°C since the mid-20th century, and may rise by between 1.6°C and 2.5°C by 2100. For this reason, the project brings together some 50 adults and over 100 children and young people. Ribalta gives a weekly educational workshop in some local schools. “When we talk about climate change and caring for the environment, the children respond immediately,” she said.